Fashion Redux: 90 Years of Fashion is a current exhibit presented by San Diego Mesa College and the San Diego History Center. This annual collaboration runs March 3–June 29. The History Center features historical garments from its extensive textile collection in addition to the historically inspired garments created by Mesa College fashion students. 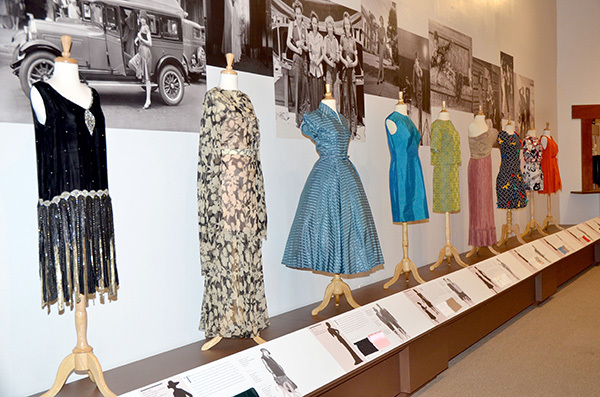 The exhibit demonstrates 90 years of fashion from the History Center’s textile collection. Demonstrations scheduled with students from Mesa College present various techniques such as draping, millinery and hat making, electronics, felting, hand patterning and computer pattern design. Interactive exhibits with fabric touch boards are set up so attendees can touch and feel the fabrics. This year marks the seventh annual Fashion Redux. Students inspired by the historic garments found in the History Center are able to then create a design from their inspiration. The walls of this exhibit are filled with large mural images of fashion photographer Charlie Schneider. They are from photo shoots in the ’50s and ’60s. Additional photos are from a photo shoot with the top four student designers and were taken by fine art photographer Siobhan Gazur. MIMI Academy presented the second annual graduation and release of the AK Beauty & Fashion Magazine at the Encore Hall downtown on March 4. This upbeat event included a fashion show highlighting the newly graduated models. This modeling school teaches not only how to walk and pose but how to put together a portfolio, attend a casting call, and how to get editorials and commercial modeling gigs. This evening was the culmination of nine months of studying and hard work. This red-carpet event began with a step and repeat. The Mistress of Ceremonies for the evening was award-winning journalist Gloria Gold from “The Gloria Gold Show.” Judges for the evening were Luis Gonzalez, Anita Meza, Territa Torres, and Kelly Lenahan. Ivonne Sepulveda was given the Women in Business Award. Sepulveda is a makeup artist. While working as a lawyer, she pursued her dreams and went to Cosmetology School in Chula Vista in 2007 and then went on to open her own business following her passion. The newly graduated models rocked the runway in all ages and sizes. They wore creations by fashion designers and demonstrated their skill as fashion models. Wear Art, Live Art by Dawn Hough Sebaugh stood out in the crowd with wearable art work on leggings, tank tops and tote bags. 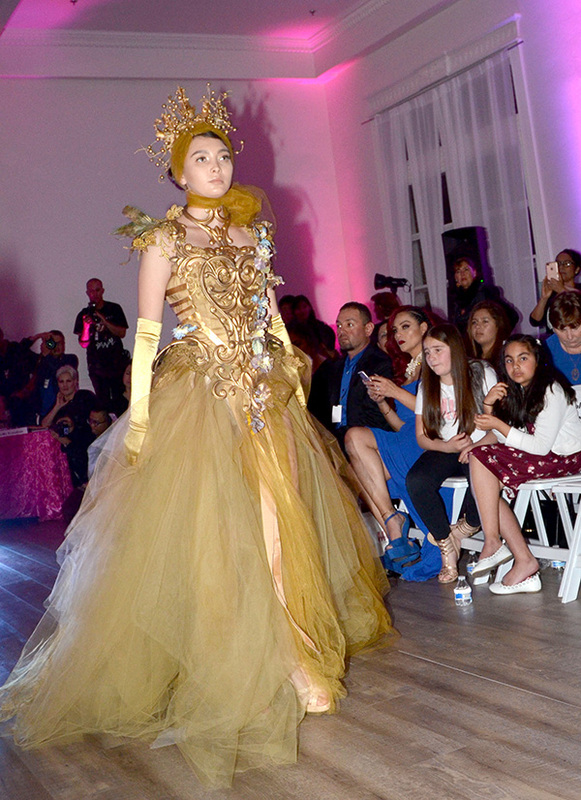 Veteran Couture by Carolina Hernandez wowed the crowd with her seductive evening dresses. The evening culminated with the amazing creations of Llenuel Fro. Additional designers were Tanya Jenkins, Fifi’s Coutre by Athena Kiryakos, Coco & Cruz, and Debbie Solan. Awards were given to Madison Stroud, who won the cover of the AK Beauty & Fashion Magazine, and to Crystal Sosa who won the face for the next MIMI Models season campaign. For more information about the modeling school, call 619-389-6923. — Diana Cavagnaro is an internationally renowned couture milliner based in the Historic Gaslamp Quarter. Learn more about our hat designer, teacher and blogger at DianaCavagnaro.com.